Control click heading above to hear audio of Howard Chace's "Ladle Rat Rotten Hut." As far as I know, only three magazines have made their entire back issue archives available on discs. These are Mad, National Geographic and The New Yorker. Now here comes a whole new ball game. Sports Illustrated just made its archives available online with an easy-access reader employing scrolling thumbnails and a simulation of page turning. One can read straight through an issue with easy zoom or search. Type Favre into the search engine, and you'll get back over 1656 results (436 articles, 181 photos, 24 galleries, 1000 videos and 15 covers). The SI Vault has some 50,000 stories, 2,800 covers, 500,000 photographs and a Wiki for entering corrections and "building a world-class sports encyclopedia" plus video clips from ESPN, NBC Sports, NFL, AOL and other sources. I decided to test the advanced search function. I remembered that the first issue in the mid-1950s had a short item about Howard L. Chace's "Ladle Rat Rotten Hut." I tried both his name and the title of his book, Anguish Languish (Prentice Hall, 1956). 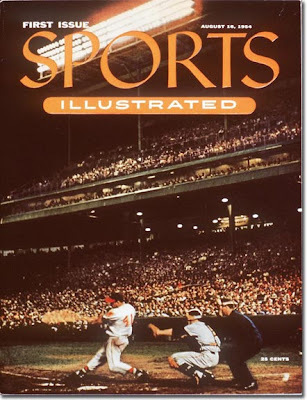 I got an August 17, 1959 issue with an article on Chace but not the first issue of Sports Illustrated. However, the 1959 article enabled me to figure out the date of the debut issue (August 16, 1954) and going through the first issue page by page, I found the Chace item, titled "Parlor sport," on pages 25-26. If you begin at the first issue, you can click through each of the 1954 covers and also email covers. Who was Howard L. Chace? In addition to providing organ music accompaniment for silent film screenings, he was a professor of Romance languages at Miami University (Oxford, Ohio) who stumbled onto the fact that virtually any syllable in the English language can be replaced by a similar sounding syllable. As Chace later explained, "an unbelievable number of English words, regardless of their usual meanings, can be substituted quite satisfactorily for others." With that realization, he began to write familiar nursery tales and rhymes into what he called Anguish Languish. Chace's creation first surfaced in Gene Sherman's "Cityside" column in the Los Angeles Times and moved on to the San Francisco Chronicle before it was picked up by Sports Illustrated. In 1995, Dorothy Behlen Heinrichs recalled that "Ladle Rat Rotten Hut" was "written by my great aunt Iola's second husband, Howard Chace, a professor of English at Miami University. I have a copy of it somewhere that he gave me one Thanksgiving. He was also a gifted organist. He used to play organs during silent movies to provide the excitement. My father was crazy about him and gave him the key to our house to come over and practice on our organ anytime." Lessen, poisoned gulls, ditcher wander hair annulled furry tell a boarder Slipping Booty? Hoecake? Wail, heresy starry. Wants dare worsted putty ladle prances hoe hat ban putter slip furry hunter cheers buyer wicket an shellfish furry gourd murder. Dish putty gull, pimple set, worse line honor bet, sounder slip, inner bet rum off annulled gloaming casserole, saturated inner lodge, dock florist. This sort of double-talk is very familiar to Australians because we had our own version back in 1965 - we called it Strine [=Australian].